Chan, Tze Khee, et al. "House dust mite–induced asthma causes oxidative damage and DNA double-strand breaks in the lungs." Journal of Allergy and Clinical Immunology (2016). Ahrabi, Sara, et al. "A role for human homologous recombination factors in suppressing microhomology-mediated end joining." Nucleic acids research (2016): gkw326. van Sluis, Marjolein, and Brian McStay. "A localized nucleolar DNA damage response facilitates recruitment of the homology-directed repair machinery independent of cell cycle stage." Genes & development 29.11 (2015): 1151-1163. Pfister, Sophia X., et al. "SETD2-dependent histone H3K36 trimethylation is required for homologous recombination repair and genome stability." Cell reports 7.6 (2014): 2006-2018. Ferdousi, Leyla Vahidi, et al. "More efficient repair of DNA double-strand breaks in skeletal muscle stem cells compared to their committed progeny." Stem cell research 13.3 (2014): 492-507. Poh, Wei Theng, et al. "Xenopus Cdc7 executes its essential function early in S phase and is counteracted by checkpoint-regulated protein phosphatase 1." Open biology 4.1 (2014): 130138. Sato, Satoshi B., et al. "Inhibition of constitutive Akt (PKB) phosphorylation by docosahexaenoic acid in the human breast cancer cell line MDA-MB-453." Biochimica et Biophysica Acta (BBA)-Molecular and Cell Biology of Lipids 1831.2 (2013): 306-313. 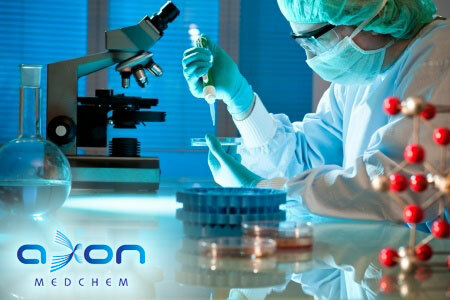 * BX912 (Axon 1130) and NU7441 (Axon 1463) are from Axon Medchem. Okazawa, Seisuke, et al. "Inactivation of DNA–dependent protein kinase promotes heat–induced apoptosis independently of heat–shock protein induction in human cancer cell lines." Plos one 8.3 (2013): e58325. Fortini, P., et al. "DNA damage response by single-strand breaks in terminally differentiated muscle cells and the control of muscle integrity." Cell Death & Differentiation 19.11 (2012): 1741-1749. Chayot, Romain, Benjamin Montagne, and Miria Ricchetti. "DNA polymerase μ is a global player in the repair of non-homologous end-joining substrates." DNA repair 11.1 (2012): 22-34. Sajish, M., Zhou, Q., Kishi, S., Valdez Jr, D.M., Kapoor, M., Guo, M., Lee, S., Kim, S., Yang, X.L. and Schimmel, P., 2012. Trp-tRNA synthetase bridges DNA-PKcs to PARP-1 to link IFN-γ and p53 signaling. Nature chemical biology, 8(6), pp.547-554.